All transactions are safe and secure with a reliable history in online purchasing behind each of our associates. Buy the Acorn Wreath Bambi shirt to own Bambi clothing and merchandise. 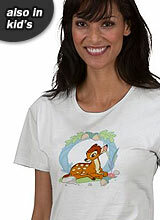 Bambi shirts will always be a hit for children and adults but for different reasons. For kids, it is simply a great story about a cute deer they find funny and furry, but for adults it is a reminder of their own youth and churns up feelings of nostalgia. Neither reason is better than the other, as both give fans a connection that is hard to break. Whichever reason relates to you doesn't matter, because both can be satisfied by picking your favorite Bambi t-shirt design now. Want even more? Get a Bambi plush toy from the gallery so you can tote him around wherever you go. In addition to the Acorn Wreath Bambi tee above, browse the Bambi Clothing Gallery for more apparel like men's and women's clothes, kids shirts or hoodies.